The end of summer is approaching fast and it's important to get in all those last minute fun activities before it's back to school time. 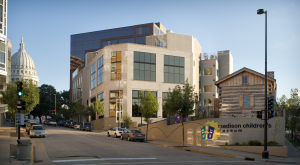 When planning your next summer fun day, be sure to visit Madison Children's Museum located at 100 N. Hamilton Street on Madison’s Capitol Square. Madison Children’s Museum is dedicated to ensuring all families have a positive experience during their visit to the museum. The museum was built with the intention of inspiring families to pursue green practices in their own lives, the museum took on the challenge to "go beyond green" in its building design. A variety of Bradley's restroom fixtures, which conserve water, energy and natural resources, proved to be a perfect choice for the restrooms, says Ruth Shelly, Executive Director, MCM. Five of the museum's restrooms feature Bradley's Express® MG Lavatory Systems made of Terreon®RE, a solid surface material comprised of a bio-based resin, pre-consumer recycled granule fillers and other natural materials. MCM actively involves their visitors in learning more about its sustainable elements with a "green tour" scavenger hunt. 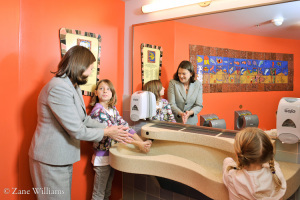 Each restroom is also designed around a kid-chosen theme, such as vehicles, fruits and vegetables, and the night sky, which are conveyed by colorful ceramic tiles hand-crafted by students. Madison Children's Museum is a must see this summer and don't forget to check out the Bradley "green" products in all the restrooms!